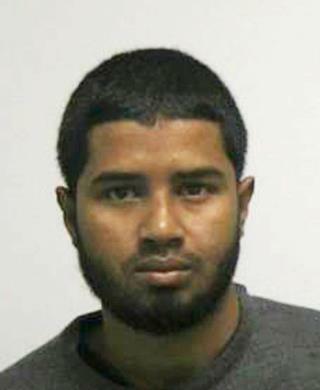 (Newser) – A Bangladeshi immigrant convicted Tuesday of terrorism charges after setting off a pipe bomb in New York City's busiest subway station at rush hour told the trial judge he was angry at President Donald Trump and didn't carry out the attack for the Islamic State group. The verdict against Akayed Ullah was returned in Manhattan federal court after a trial in which the defense maintained he intended to kill only himself last Dec. 11, the AP reports. Nobody died, and most of the injuries were not serious. After the verdict was announced and the jury left the room, Ullah spoke out, telling the judge: "I was angry with Donald Trump because he says he will bomb the Middle East and then he will protect his nation. So I said: 'Donald Trump, you cannot do like this.' Nobody likes bombing, your honor." Judge Richard Sullivan told him: "Right now is not the time for a statement." "setting off a pipe bomb in New York City's busiest subway station at rush hour" cause he's mad at the Prez? I had to double check the DOJ entry to make sure it was not a misquote. But its right, he is to be sentenced April 5th, 2019. I realize the wheels of federal justice move like honey but that's a bit of a stretch. I mean he will spend a morning or afternoon with a specialist from the US Probation office for the pre-sentence investigation. They will ask him if his mommy was abusive and all of that Freudian stuff. I'm sure his attorney has already advised him of the length of time the sentencing guideline spreadsheet shows he will get. Had he been a slightly more competent bomb maker we would not have had to deal with this court proceedings and he would be 6 feet under right now. You know just enough to kill him but otherwise not cause any serious damage would have been nice.